Monday Night Music presents “The St. Michael’s Duo,” Monday, October 28 at 7:00 p.m. The concert will take place in McDaniel Lounge. The St. Michael’s Duo is an artistic union created as a result of their strong desire to be together on stage, as well as in life. Beginning in 1995 as students at conservatory, the duo has dedicated their passion to music, faith and family. The performance will feature selections by Mozart, Bach, Vieuxtemps, Fuchs, Handel, and others. James Tung, violinist, has performed as a soloist with the Frederick Symphony Orchestra, held recitals at Frederick Community College and has been invited as a Chamber Musician at McDaniel College, Gettysburg College, and at Mount Saint Mary’s. Former Concertmaster of the Frederick Symphony Orchestra, James Tung frequently performs with the Annapolis Symphony, Maryland Symphony and Gettysburg Chamber Orchestra. 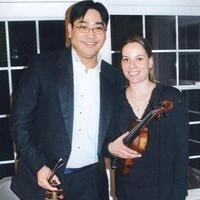 He attended the Eastman School of Music in Rochester, NY where he received a Bachelor's Degree in Violin Performance. McDaniel College Faculty artist, Alice Tung, violist and accordionist, is a member of the Maryland Symphony and the Gettysburg Chamber Orchestra. Former Principal Violist and Soloist of the Frederick Symphony Orchestra, Alice also performs in orchestras throughout northeast region including Virginia's Alexandria and Fairfax Symphony Orchestras. She received her Bachelor of Music in Viola Performance from the Eastman School of Music and her Master of Music in Viola Performance from the Peabody Conservatory.